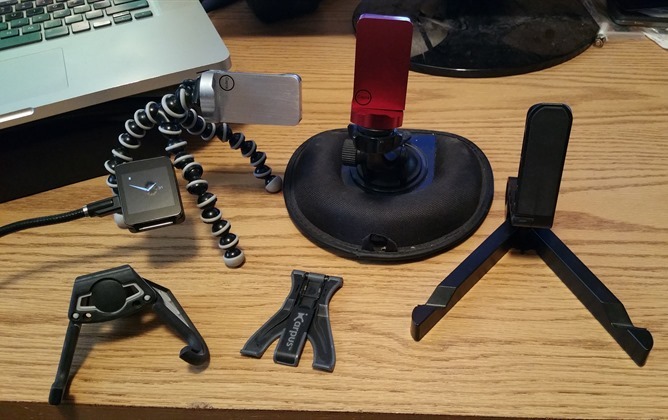 When it came time to think about writing a “What We Use” post last year, I was still somewhat new to the AP team and I had just learned that I was about to be the new Teardown guy, so I took a pass on attempting to compile my entire toolset in a single article. I can’t say that I’m any more prepared to do one this year, but I couldn’t resist joining in on the fun. But like Bertel, I also realized a lot of people probably don’t know much about me, so this is a good time to give a little bit of background. To begin with, I’m not your typical writer. In fact, I’m really a developer that can put together a decent string of words. Of course, even as code monkeys go, I’m pretty abnormal. I did my time in the corporate landscape, but most of my career has been spent contracting, which gave me the opportunity to dabble in several different industries from manufacturing, to fashion, to travel. I’ve written software for just about every major desktop and mobile OS that still exists, and I’ve coded in more languages than I care to think about. Since so much of my life has involved travel, it’s almost instinctual that everything I have and use is somehow portable or it can be broken down to fit in a suitcase. However, things get complicated by the need to have several different gadgets handy for testing and development. The result is an oversized collection of redundant gadgets, each is rarely used to its fullest potential. Anyway, enough about me, let’s get to my stuff! I got my first smartphone back in 2006. It was the Cingular 2125 (HTC Faraday), and I actually still have it sitting just about 3 feet away. It still works, too. In the 8 years since, I’ve been through 7 different “carry phones.” That’s the term I use for the phone that I actually take with me when I leave home. The HTC One (M7) has been my carry phone since it launched. I absolutely love this phone. It looks great, the screen is perfect, and the speakers – seriously, those speakers – I’m spoiled by how great they sound. I even like Sense. If it weren’t for the mediocre camera and battery life that’s just a bit too short for the way I use my phone, I’m not sure I would give this thing up in the foreseeable future. However, I'm about to pass the M7 on to my mom. I will miss it. With that said, I just got the Samsung Galaxy Note 4. The stylus, larger screen, and battery are compelling aspects of the phone. I really don’t care for TouchWiz, but there have been several occasions where I’ve needed to have a modern Samsung device for app development and testing, so I decided to take the plunge. If things don't work out, I'll probably have my eye on whatever HTC will launch early next year. When I need to test anything on stock Android, my Nexus 5 is always close-by. I also have a Nexus 4 lying alongside a mostly useless iPhone 4, both former carry phones. I’m currently debating if I should drop even more money to get the Nexus 6, but the price seems a bit higher than I'm prepared to spend on the hardware, so the Nexus 5 may have to hold the fort as my stock Lollipop phone. I also have an assortment of other gadgets collecting dust, including some that run Windows Mobile, Windows Phone 7, and even a Blackberry Z10 Developer Edition. Half of these are old carry phones, the others are leftovers from different development jobs. Allow me to take a moment to mention cases. Unlike many on the Android Police team, I put cases on most of my phones. I realize phones have been designed to look and feel good unencumbered by additional plastic, but I also believe they were designed to be thin enough to allow us to put on a protective case without turning them into lumbering bricks. My current favorite is the Spigen Neo Hybrid on my Nexus 5. I really really like the independent buttons and the solid feel, but it is a real pain to remove when I need to swap in a SIM card. I picked up a similar case for the Note 4, but I don't like it as much, particularly because the opening for the heart rate sensor is far too small for human fingers. I'll probably keep looking for a replacement. I’ve always been a huge fan of tablets, but I never seem to use them that much. Most of my reading occurs on a phone while I’m on the go, or on a computer when I'm at home. I don’t have a single primary tablet, but I do have a few scattered around the house. If I’m reaching for anything, it’s probably the LG G Pad 8.3, just because the screen is the nicest of the batch and it's really lightweight. I used to rely on my original Nexus 7 (2012), but it runs so slowly I can’t stand to use it anymore. These days, it just sits in its dock, acting as an alarm clock. I would have the 2013 model, but the one I originally purchased had so many problems that I returned it and never looked back. There's also an original Samsung Galaxy Tab 10.1 and an iPad 3, both of which I rarely touch. At least the iPad is used by others in the house for occasional gaming. I can see the appeal of the iPad, but I think iOS took a noticeable downward turn a few years ago, and it's still trying to pull out of it. I'm looking forward to the Nexus 9, when it gets here. I think it may finally fit the bill for what I want from a tablet, and it’ll be pretty important for covering issues in Android L, especially since I'm probably taking a pass on the Nexus 6. 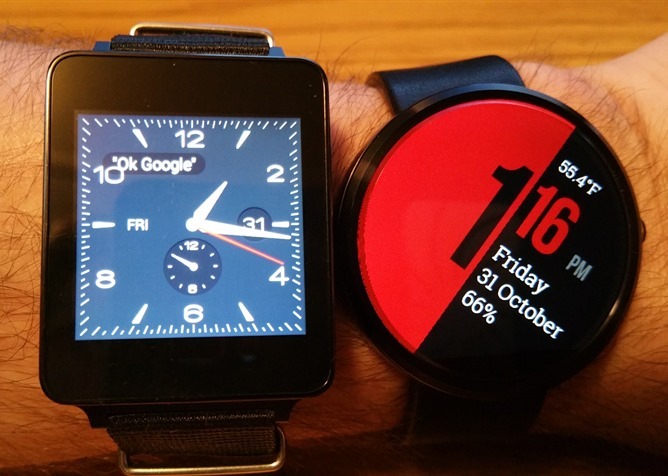 While I'm probably in the minority among my colleagues, I love Android Wear. It has plenty of growing up to do, but I already feel mildly dependent on its notifications. In fact, I’ve found that extensive use of the watch is responsible for a non-trivial improvement to the battery life of my phone. Like most Google I/O 2014 attendees, I’ve got an LG G Watch and a Moto 360. (Hardly anybody picked up the Gear Live.) I’ll just say what everybody else is thinking: LG put out a clunky, unattractive block of plastic and glass, then attached the cheapest watch band available. I wore it occasionally before the 360 came out, but never in public. I’ve removed the included plastic bands and have a NATO strap ready to thread through it if I ever need to, but it’s generally just sitting on my desk for testing and app development. The Moto 360 is the polar opposite. It’s comfortable, it’s attractive, and I’ve been happily wearing it out in public since I got it. I prefer it with ambient mode turned off (so the screen shuts off instead of just dimming), and my battery life is so good that I've rarely put it on the charger with less than 40% remaining. Although, even with ambient mode on, I don't think I've ever been in the red. While I like the 360, I must confess that it doesn’t quite match the look I want to have, so I’m excited for the second generation of Wear devices and the new features and styles it will bring. I’ve become something of a multi-OS kinda guy. I routinely use both OS X and Windows, though I have grown to prefer OS X. Believe me, that’s something I never thought I would say… ever. Most of my development work and day-to-day stuff happens on a 2009 MacBook Pro. Thanks to a Core 2 Duo processor and 8 GB of RAM, it's really old, slow, and desperately needs to be replaced. I’m holding out for the huge refresh that’s expected in the summer of 2015. Nevertheless, almost everything related to Android development is far more convenient on OS X, in part because of the *nix underpinnings. I also like the physical build and battery life of the MBP line. I’m practically counting the days until WWDC 2015. Of course, I also do a lot of work on Microsoft’s technology stack, and a large portion of the articles I write for Android Police are done on my Windows machine. It’s a Sony VAIO from mid-2012 with specs just shy of being high-end. I’ll admit, I chose poorly. It has plenty of power for everything I want to do, but so many things about the design are terrible. My top two complaints have to do with a really bumpy textured trackpad, and the profoundly loud fans that sound like a jet engine at full thrust. I won’t bore anybody with additional details, just take my word when I say laptops are like clothes – you should always try them on in a store before buying online. I use wireless peripherals with both laptops. It’s not that I have to, but I switch back and forth between them and it’s just easier to move everything around if there are fewer cables to deal with. I use Apple's Magic Trackpad and a standard Apple Keyboard with the Mac. The trackpad is pretty awesome, but the keyboard I’ve just been using because it was cheap and I never quite get around to replacing it. On the VAIO, I’m sticking to Logitech’s unifying receiver because Bluetooth stability on Windows is really terrible. I’ve paired it with the M570 trackball, which is pretty awesome, and a TK820 keyboard w/ built-in trackpad, which is way less awesome. Everything about the TK820 is just ok, but a lot of little things about it disappoint me. I keep looking for new keyboards, but my favorite was the DiNovo Edge (I bought it for so much less than it’s currently listed). I also have an older 25” Samsung LCD in my office that both laptops share, but there’s not much to say about that. I’m a nut for having good hardware to prop up my gadgets. I’ve tried several, and I will continue to try several more. Frankly, I really want to get a 3D printer so I can start making my own. 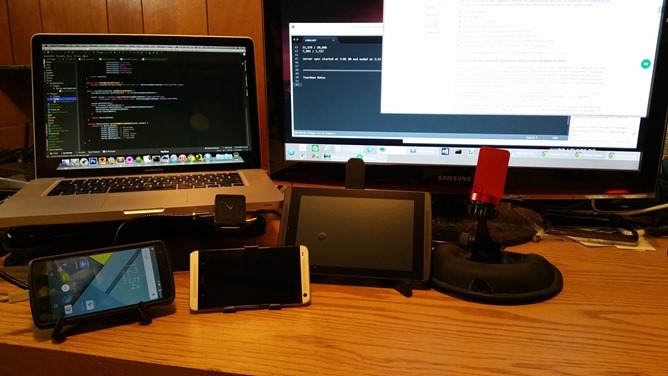 Given that I’m constantly testing my own apps or trying out something for AP, I’ve almost always got one or two devices propped up in front of me while I’m working. No matter how many I’ve tried, I seem to keep coming back to these. You may notice, they’re all incredibly travel-friendly. Amzer Foldo Stand (for tablets) – You’re never going to find a more portable stand that works better than this one. When it’s open, the base weighs enough and has a wide footprint, so there’s plenty of stability. It folds down to be just barely larger than a Sonicare toothbrush, and there are no rough edges, so it can easily fit into any open corner of a bag. iCarpus Stand (for phones) – I don’t use this one as often, but it’s convenient if I want a stand I can fit into a pocket. It’s tiny, light-weight, and surprisingly stable. Now that Android Wear can be used as a remote shutter, I think this will be a handy tool to stabilize the phone for a good group shot. Amazon has been out of stock for ages, and the product website claims that this particular model is discontinued and a new version is coming; but I emailed the company weeks ago and there still hasn’t been a reply, so this might be a dead product. Eagle Pod Stand (for phones) – This is probably the stand I actually use the most, primarily because it doesn’t lock onto the phone like the iCarpus. When I’ve got to pick up and set down the phone frequently, it’s just the most convenient option. It has a wide footprint for stability and the angle of the tilt is adjustable. It was also designed so that it could be folded open into a flat shape, so it’s also incredibly portable. Note: when I bought mine, it was only $5, and the currently linked one on Amazon is 5x that price, but it’s not hard to find the same thing for much cheaper. Vaas Zero-Gravity Gooseneck Cable (for smartwatch) – I really don’t think rigid cables are a good idea for most phones. They just put too much strain on the microUSB port, and even the regular USB port of a computer. However, I’ve found that it’s incredibly convenient for holding up and positioning the cradle of my LG G Watch. I confess, I get very little use out of this cable, but I feel like this is its most suitable use case. Capta w/ Archon Friction Mount (in car) – I’ve tried a couple dozen car mounts, and I seem to keep coming back to this solution. I don’t feel like it’s the best option, but it’s the most versatile. I usually try to use the suction cup on the windshield most of the time, since it’s stable and easy to use. Since I regularly go into California, which forbids placing anything on the windshield, I’ll attach the friction mount before crossing the state line. Ignore the Playstation 3 in the background, it hasn't even been turned on in 2 years. When it comes to TV, I care quite a bit about making my experience as convenient as possible, as long as I’m not sacrificing quality. Unfortunately, there’s no product that really encapsulates everything I want to have. Since my Internet connection has been pretty shaky over the years, I’ve dedicated a lot of effort (and money) to building a large collection of digital content, mostly TV shows I’ve ripped from DVDs. I can stream video, but it’s unreliable and if I want anything at really high quality, I generally have to download it first. For example, I regularly download the high-def versions of Google I/O sessions after they come out so I won’t have to pause them while they cache. 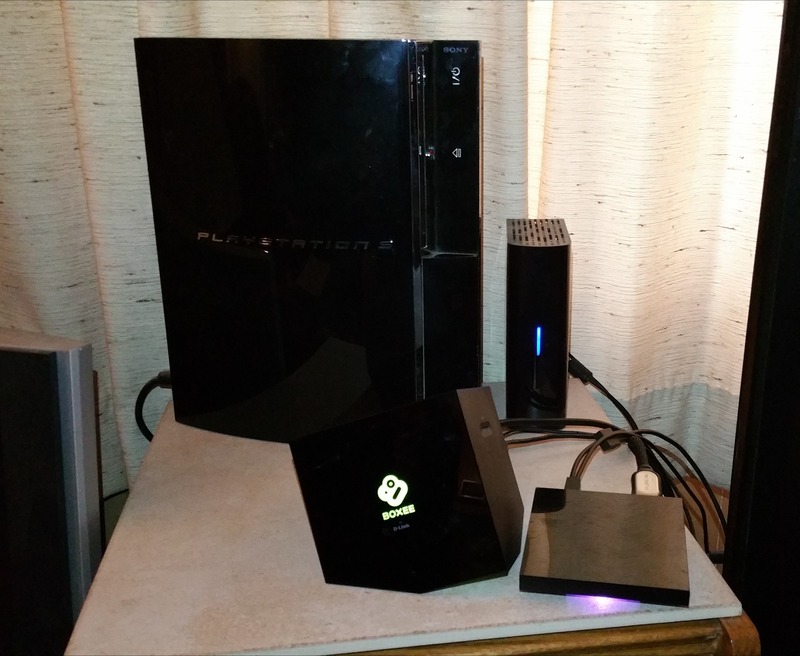 Boxee Box – The last half-way decent set top box suitable for my niche was the original Boxee Box. It’s woefully underpowered and slow, poorly designed, missing many obvious features, and its system for identification is a shameful mess the developers should never admit to on a resume – but it’s the only option I’ve found that works well with an external USB hard drive and doesn’t require a separate computer for local streaming. I can already predict the comments will be filled with people advocating for Plex or some other alternative, I hear it all the time. Simply put, I don’t want to set up a whole separate server just to stream data locally to my TV. That’s an over-complicated solution and I see no point in it. I’m eager to replace this thing, but not by adding several additional moving parts. Chromecast & ADT-1 – As I said earlier, I’m not incapable of streaming, so these are still valuable additions to the collection. I still feel like the experience is a bit immature for what the products are intended to be, particularly on Android TV, but they are getting closer to their real potential. By this time next year, I expect to have fully moved to an Android TV device, and I’ll just keep the Chromecast stashed in my car or a travel bag when I need it. My nature for working on so many operating systems gives me a lot of options for tools I can use, but it also makes for some difficult choices. I rarely have the option to use the same application on both laptops, which makes it more difficult to form muscle memory and memorize hotkeys. I do have a few things set up that I consider vital for just about everything I do. Sublime Text 3 – Yes, I’m totally starting off with a text editor! It is that vital, and any good developer will know what I’m talking about. It’s not technically the most powerful editor available on either Mac OS or Windows, but it’s close. It’s the only editor I’ve found that runs on both platforms; and it either includes all of the features I need, or there are plugins for everything else. When I’m doing a teardown, this is the text editor I drop everything into. Besides the Chrome browser, it’s the only other app that’s open 100% of the time. Go (scripting language) – Strictly speaking, Go isn’t really a scripting language, but it can fill that role perfectly. Execution speed is off-the-charts-FAST thanks to native compilation, and it’s a bit more capable than languages like Python. I’m working on transitioning some of my custom scripts over to Go, but it takes a bit of time. Borderlands 2 – ‘nuf said. 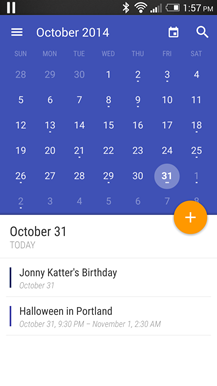 Timely Alarm – The visuals are nice, but I mostly use it because it offers alarm syncing, which I use more than you’d expect. 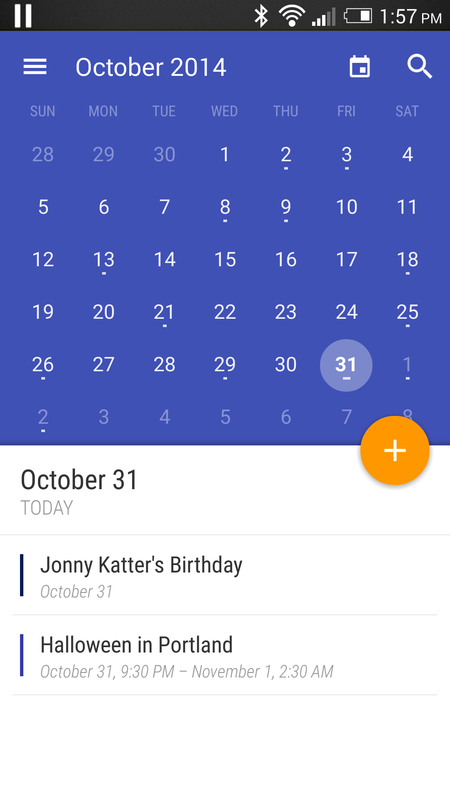 Today Calendar – I don’t actually need a calendar very often because of the way I manage my time, but this one fits in very nicely. SwipePad – It’s a must have, because I launch the same 5-6 apps several times each day, and getting out to a launcher screen feels too slow for me. LinkBubble – I don’t think I even need to explain this, but I just like the convenience. Most of the links I open are just for a quick glance, and hardly worth switching the current app. Until we have a good split-screen feature in Android, it doesn’t get much better than this. Like many developers, there are a few categories of apps that I feel have been very poorly done, so I often envision how I would remake them to suit my own needs. 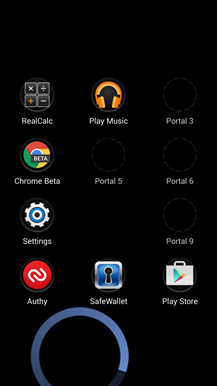 The result is that I’ve got a handful of apps that I’ve either seriously considered remaking, or actually started on. I haven’t released anything publicly, but there’s a fair chance that a couple of them will be appearing sometime after the new year. 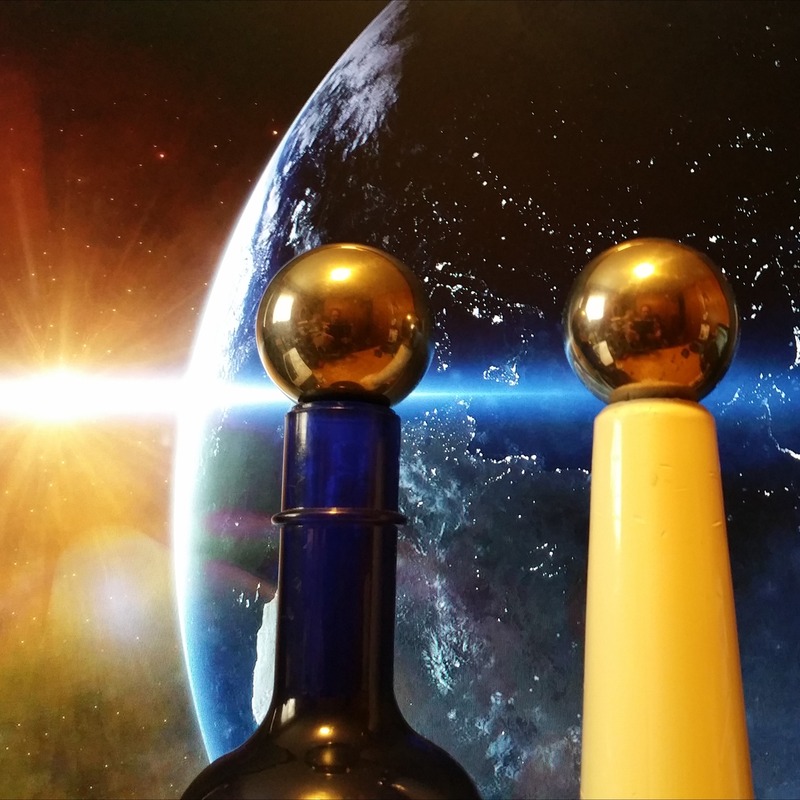 Baoding Balls – Alright, get your giggles out. I’ll wait… Seriously, these things saved my life. About 10 years ago, I was on the verge of having carpal tunnel syndrome so severe enough that I was considering surgery. The pain in my wrists was interfering with sleep and I had trouble typing for more than an hour or two without taking long breaks. I tried wrist braces, medications, and ergonomic keyboards, but none of them did a bit of good. After reading that Baoding balls might help, I bought a pair as a last resort. Within a couple of weeks, I stopped using the braces and the silly split keyboard – and within the month, the pain was basically gone. I’ve stopped practicing with them on a regular basis, but I don’t have to anymore. 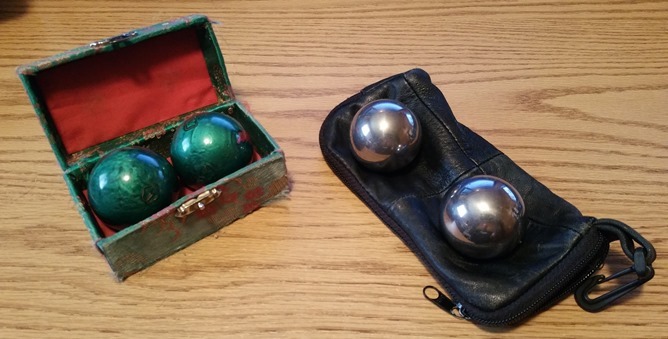 A few years ago, I graduated from using hollow balls with chimes to full stainless steel balls *snicker*. After a few months with that much extra weight, I'd strengthened the muscles enough that I really didn’t have to keep up with constant practice. Nobody should start with solid metal balls; but just like lifting weights, it pays to start with something simple and progressively increase the challenge to achieve better results. Flair Bottles – When it comes right down to it, I've always loved working behind a bar. I did it for a few years after college, and it was a ton of fun and great exercise. One aspect that really excited me was something called 'flair bartending.' That's what you call it when bartenders flip bottles and shaker tins while they're mixing drinks. Just check out some competition videos on YouTube to get an idea of what I'm talking about, it's amazing. When I've got to get out of my chair for a bit, but I don't have time to go for a run or work out, I'll take a quick trip to the other room and throw these around for a few minutes. 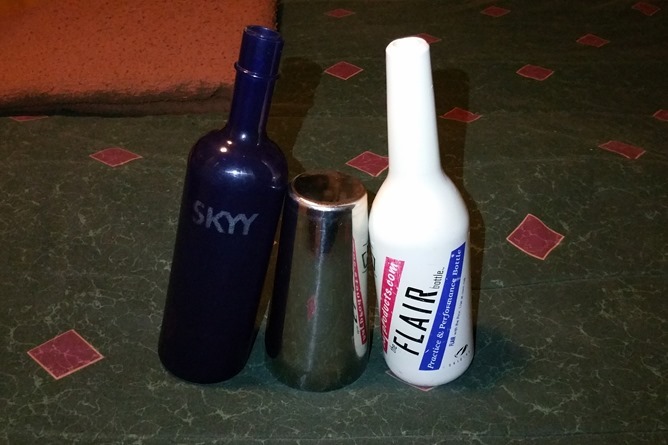 The bottles are made of PVC plastic so they won't break when they inevitably go tumbling, and the shaker tin in the middle of the photo is made of metal. I keep forgetting to make some videos, but I'll show off some of my moves sometime soon. It's a great way to get the blood flowing. If it's not abundantly clear from the pictures in this post, I don't have a decent camera. The Galaxy Note 4 was used for all of the shots you've seen here (except for the picture of my phones), and it's really not operating anywhere near it's potential. Of course, I'm also a pretty bad photographer, so I can't blame everything on Samsung. Nevertheless, sometime in 2015 I'm going to invest in hardware that should produce some slightly less embarrassing photos. Since most of my house is really dark, I'll also put together a decent lighting station until I can get moved to a new place. That’s about it, but I’m sure there are a couple dozen things I’m forgetting to mention, but this is already a pretty long list. I left out things like headphones and desks because my current setup still feels wrong to me, but not in ways that are that interesting. Of course, if there are any questions, I’d be happy to answer them.